“Keep your face toward the sunshine,” wrote Walt Whitman, “and the shadows will fall behind you.” These words are a fitting introduction to the last day of our literary tour, as we navigated the tricky traffic of the greater New York metropolitan area for our last scheduled stops. We spent last night at the gracious home of Jen and Pat (otherwise known as Jenny-Pat) in Darien, CT. Thank you so much, Jenny-Pat, for your hospitality and kindness (wine, snacks, and breakfast!). Once on the road, we first made a pitstop in Tarrytown, New York at Sunnyside, Washington Irving’s home. 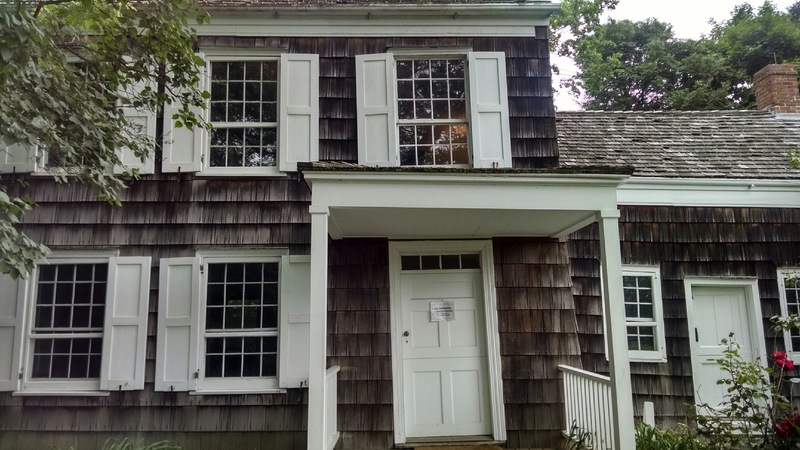 This was the place of his retirement after a lifetime of travel, letters, and writing best-selling stories such as Rip Van Winkle and The Legend of Sleepy Hollow. Not surprisingly, as the authors on our tour moved in very small circles, Irving served as a mentor to Poe, Melville, and Hawthorne and even corresponded with Dickens. Due to the timing of the tours, and the extent of our travels, unfortunately, we weren’t able to go inside Sunnyside, but we did catch a glimpse of the beautiful landscape bordering the Hudson River. This is on the agenda for next time, for sure. We next made our way to the birthplace of Walt Whitman, one of the primary poets who (along with Emily Dickinson) ushered in the era of contemporary poetry through works such as Leaves of Grass. The home is a very simple colonial farmhouse in Huntington on Long Island, New York (picture one, below). 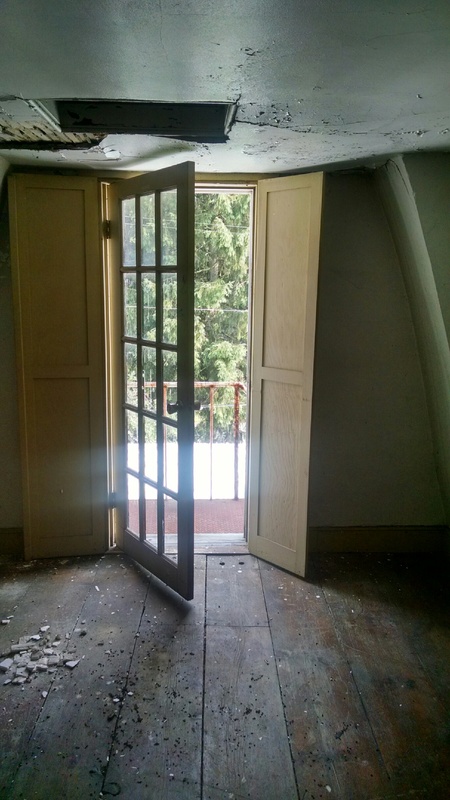 He lived here only three years and therefore there are only scant remnants of his life at this location, but the inside of the home includes period furniture meant to replicate his time in the house. 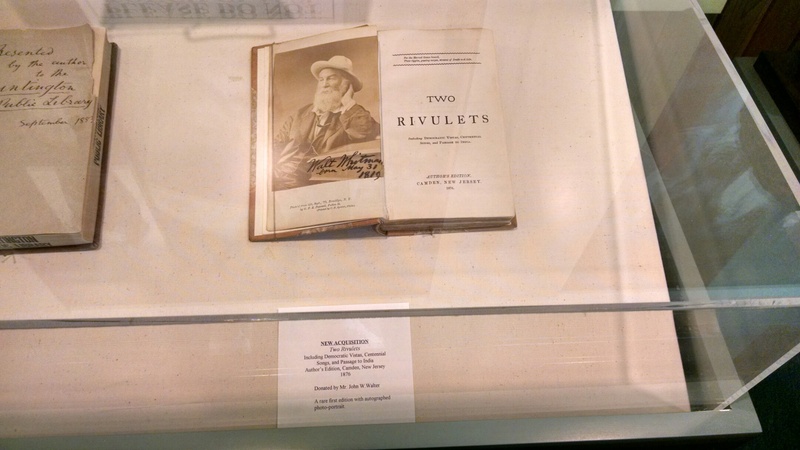 His home in Camden, New Jersey, which includes more personal possessions, may be a better reflection of the poet but the visitor’s center here features a helpful timeline and a couple of things, such as a rare first edition (autographed!) of a work titled Two Rivulets (picture two) and the desk he used during his stint as a teacher in New York (picture three). We were lucky enough to end our travels at the same place we began–the home of the wonderful Kretchmars in State College, PA. Although we’re sad to end our literary extravaganza, we’re proud to say that we covered five states and a total of 19 actual sites! And Ann, Jen, and I will return to North Carolina tomorrow with a renewed appreciation of our favorite authors and more inspiration for our own creative endeavors. Since some of you have kindly asked, next time I’ll post the full itinerary of our journey, along with a few details of our more serendipitous pitstops. For now, good night, and I hope you are curling up with a good book! This entry was posted in Uncategorized and tagged charles dickens, edgar allan poe, herman melville, huntington, leaves of grass, literary tour, nathaniel hawthorne, new york, sunnyside, tarrytown, two rivulets, walt whitman, washington irving on June 19, 2015 by Ashley Memory. Today was the first day of a much anticipated American Literary Tour through New England. 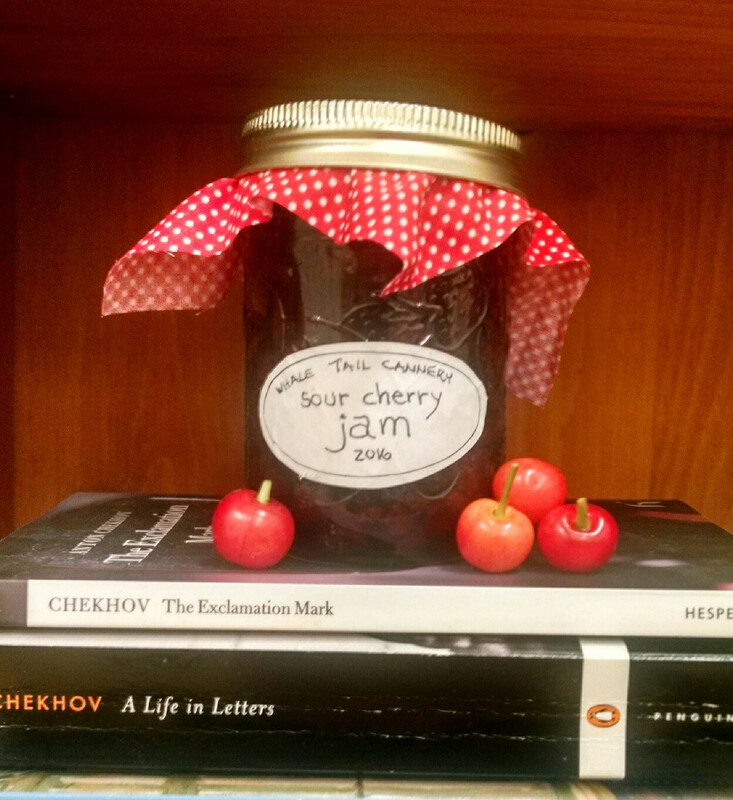 My friends Jen and Ann and I kicked off an eight-day blitz through some of the famous sites of American Literature. We began by stopping in Richmond, home of the Edgar Allen Poe Museum. Although Poe never lived here, it is the oldest building in Richmond, constructed entirely of stone. He spent some of the happiest years of his life in Richmond and considered himself more of a Southerner than a Bostonian, although he was born there. 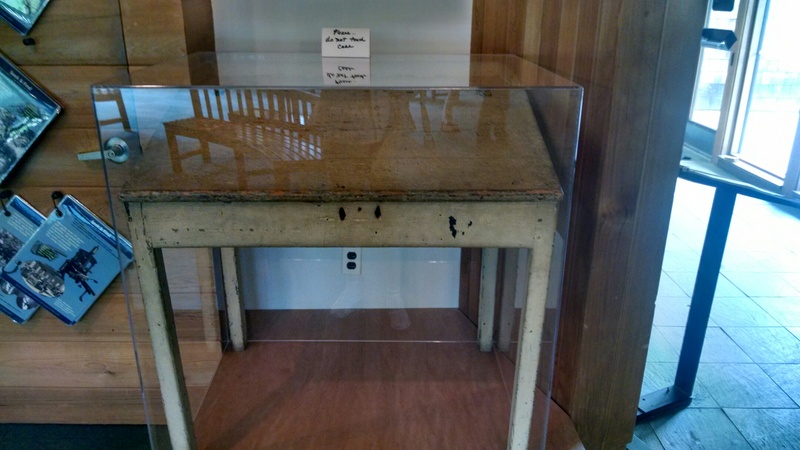 The museum featured personal possessions of Poe, including one of the few extant handwritten poems to a childhood girlfriend, “To Helen”; a trinket box owned by his wife, Virginia; his trunk; and even a lock of his hair. 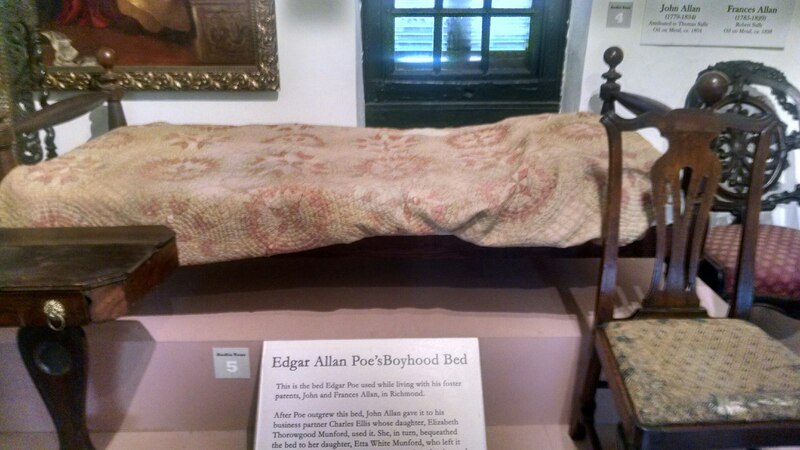 None of the houses where he lived while in Richmond still exist, but the museum features several pieces of furniture, including his boyhood bed, pictured below. Next, we went to Potters Mill, Pennsylvania, the location of Eutaw House, a tavern built in 1794 and reputedly the site where Poe penned his most famous work, The Raven. Today Eutaw House is home to a used car lot and has been made into apartments. We feared it was inaccessible but the adventurous Ann (at her most brazen) charged through the lawn, unlatched the gate, and climbed up the steps to the third floor. The picture below shows the room where he allegedly wrote this poem. Inside you could sense the ambience that inspired his poem. After polishing off a couple Amish Whoopie pies, we journeyed to State College, where Jen’s parents Janet and Scott live. 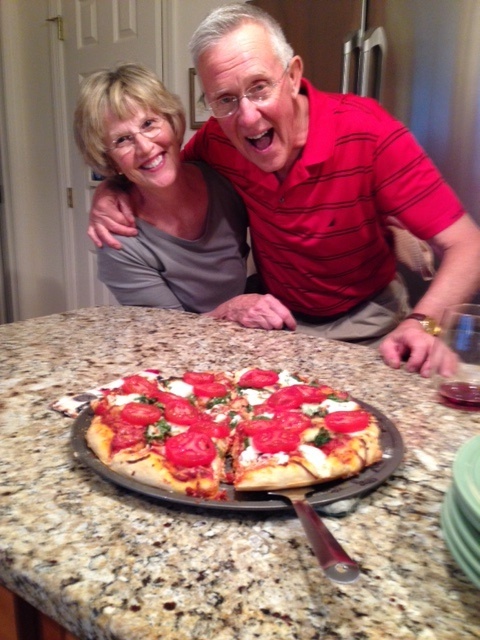 They are kindly hosting the first and last night of our tour and treated us to wine and a homemade pizza buffet. Tomorrow we plan to get up at the crack of dawn and travel to Austerlitz, New York, and the home of poet Edna St. Vincent Millay. Stay tuned for the next edition of our journal, which will feature highlights of our journey. In addition to stops in New York, we’ll go to Massachusetts and Connecticut. 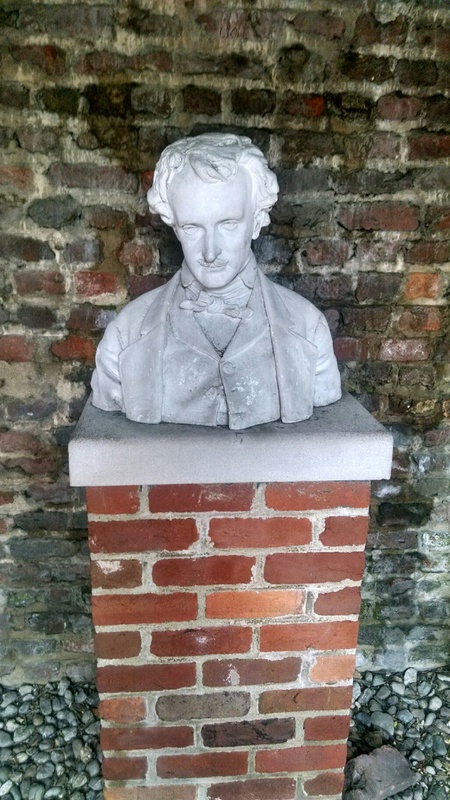 This entry was posted in Uncategorized and tagged edgar allan poe, poe museum, potters mill, richmond, the raven on June 11, 2015 by Ashley Memory.